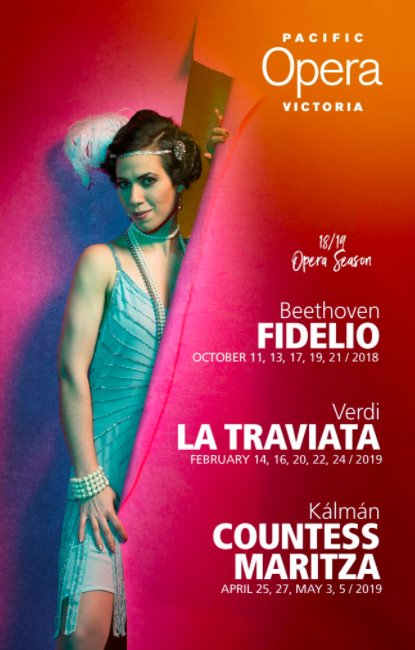 Pacific Opera Victoria has announced their compelling 18/19 season, which includes the classic operas: Fidelio by Beethoven, Verdi’s La Traviata, and Emmerich Kálmán’s light-hearted operetta, Countess Maritza. All of the productions will be presented at Victoria’s Royal Theatre and conducted by Timothy Vernon. Starting with Fidelio on Oct. 11th 2018 until the 21st, Wim Trompert will direct alongside his design partner Nancy Bryant. The cast includes Canadian baritone Peter McGillivray, Scottish bass Brian Bannatyne-Scott, and up-and-coming Canadian dramatic soprano Tracy Cantin playing the role of Leonore. The season continues with La Traviata, directed by Alain Gauthier and featuring Lucia Cesaroni as Violetta and James Westman as Germont. The opera will be co-produced by Manitoba Opera, Edmonton Opera, Vancouver Opera, Pacific Opera Victoria and Opéra de Montréal; five major Canadian opera companies! The production runs from Feb. 14th, 2019 until the 24th. And last but not least, the season ends with the classic silver-age of operetta, romantic comedy, Countess Maritza, running from April 25th, 2019 until May 5th. It will feature sopranos Leslie Ann Bradley and Suzanne Rigden, along with tenor Adam Luther. The opera will be directed by Glynis Leyshon and designed by Patrick Clark.